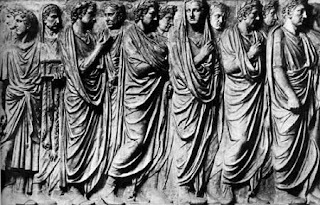 The Twelve Tables comprised the earliest codification of Roman law. According to tradition, it was promulgated in 450 BC. The eighth Table set the penalty for iniuria or wrongful injury at a fixed sum of 25 asses. This remained the penalty for centuries, long after monetary inflation had rendered 25 asses a negligible sum. The Roman conception of injury was much broader than ours today. For the Romans, with their highly developed sense of personal honour, injury need not be physical, nor need it cause any tangible material loss. Besides libel or slander, injury could also include mere insult (though for the Romans, there was no such thing as “mere” insult). The Roman antiquarian writer Aulus Gellius, in his Attic Nights (20.1.13), tells an amusing story about a wealthy citizen around the first century BC named Lucius Veratius, who had an interesting way of protesting the absurdity of the traditional fixed sum for wrongful injury. According to the story, Veratius would stroll through the Forum accompanied by one of his slaves, who carried a pouch of money. He would slap free citizens in the face (egregious iniuria by Roman legal standards) and then instruct his slave to dole out to them the appropriate number of coins. This strange form of protest did eventually lead to an overhaul of the private law with regards to iniuria. Modern legal writers and classicists, when they refer to the story of Veratius, give it out to be an illustration of the dangers of affixing a fixed monetary penalty to a violation of law. However, I think it should be given a much deeper reading. It is not the amount of money that is the key to the story. The outrageousness of Veratius’ conduct lay not in the insignificance of the sums he was doling out. Rather, Veratius acted outrageously because in his actions he seemed to regard the sum as the market cost of a certain kind of behaviour rather than as a penalty or punishment for wrongdoing. Legal scholars tend to classify private law as a form of corrective justice: Seius has done some wrong to Titius, causing the latter some loss, and in order for justice to be done, Seius must compensate Titius in an amount corresponding to that loss. So setting a fixed sum on a private law wrong does not capture this notion of the correctivity of corrective justice, for the obvious reason that if Seius has done 50 asses worth of damage to Titius, paying him 25 asses will not correct the injustice. This all sounds well and good. However, this scheme does not translate well when applied to the Roman legal context. And, as we shall see, it doesn’t really apply to ours either. First, as already noted, iniuria needn’t cause tangible loss in order to be actionable. And even if it did cause loss, it might be to something, like reputation, that was not commensurable in monetary terms. And even then, the iniuria might be done to someone who had little or no reputation to lose; it was no less an injury for that. Second, in other areas Roman law had no qualms about imposing penalties that can only be described as punitive rather than merely corrective. For example, the first section of the lex Aquilia (third century BC) provided an action for the wrongful slaying of someone’s slave or four-footed beast, and stipulated that liability was to be assessed at “as much money as the maximum the property was worth in the year (previous to the slaying).” Thus, if your slave was terminally ill, but had become that way within the year previous to my slaying him, I would have to pay you whatever the slave was worth before he became ill, not what he was worth when I actually slew him. What this means is that you would, in essence, profit from my wrongdoing. I slew a dying slave and now must pay you back the value of a healthy one. This seems more punitive than corrective. Furthermore, the lex Aquilia says that I must pay you double what the slave was worth if I have denied my liability and have then been found liable. Roman law is littered with such examples of punitive penalties for wrongdoing. Roman legislators and jurists did not subscribe unequivocally to the doctrine of corrective justice. Third, Veratius’ behaviour, formally speaking, would be just as outrageous if the fine happened to have been set much higher. Imagine that it was set at 1000 or 10,000 asses, but imagine at the same time that Veratius happened also to be extraordinarily rich. The fine would still have been negligible to him. And he would still cavalierly go about acting as if 10,000 asses were the market price for slapping people in the face. There is in most jurisdictions a more or less fixed penalty for speeding, which typically depends on how fast you are driving. If we imagine Lucius Veratius’ reaction to being caught speeding, we can begin to understand what was so outrageous about his behaviour. Veratius goes speeding, is stopped by a policeman, happily accepts his speeding ticket, pays the policeman on the spot, and then merrily drives off at the same speed. The pertinent point here is not the nominal amount of the fine. It is Veratius’ attitude towards it. Part of the purpose of a speeding fine is to discourage speeding. But there is more to it than that. The purpose is also to register society’s disapproval of such conduct, and to punish those that engage in it. Again, Veratius looks at the fine as the price he must pay to be allowed to drive as fast as he likes, much as $12 is the price I must pay in order to see a movie at the cinema. Veratius does not view his behaviour as a form of wrongdoing. A few decades ago, the Ford Motor Company became aware of a design flaw in its Pinto cars that made them a potential deathtrap. A relatively inexpensive redesign would have made the car safer and saved lives. Instead, Ford decided that it was cheaper to leave the design as it was and to pay off any litigants who sued. Like Veratius, Ford viewed legal liability as just another cost of doing business, rather than as a punishment for its wrongdoing. Ford made the same mistake as many legal scholars in assuming that the point of private law liability is merely to compensate victims for their loss; in short, they saw it in the terms of corrective justice. They calculated the potential injury they would cause through their conduct, and they decided it was worthwhile to continue with that conduct. The courts saw it differently. In Grimshaw v. Ford Motor Company (1981), the California Court of Appeal upheld (corrective) damages of $2.5 million, and further punitive damages of $3.5 million. The latter were presumably to express the court’s — and society’s — disapproval of Ford’s wrongdoing. Now, we may vehemently disagree with some of the extraordinary punitive damages that US courts have since been in the habit of awarding. And we may even disagree with the idea that such punitive damages ought to go to the injured party — after all, is it really the case that I have a right to profit from an injury done me? Perhaps such profits ought to be declared the spoils of the gods and then stuck in a temple or buried at sea. But I think we must agree that the concept of punitive damages is valid and of good pedigree. A have a similar essay about (http://www.gazetadesaojoaodelrei.com.br/site/2017/01/a-triplice-funcao-da-indenizacao-do-dano-moral/). But this is what we call e Brasil as "no Estado da Arte".